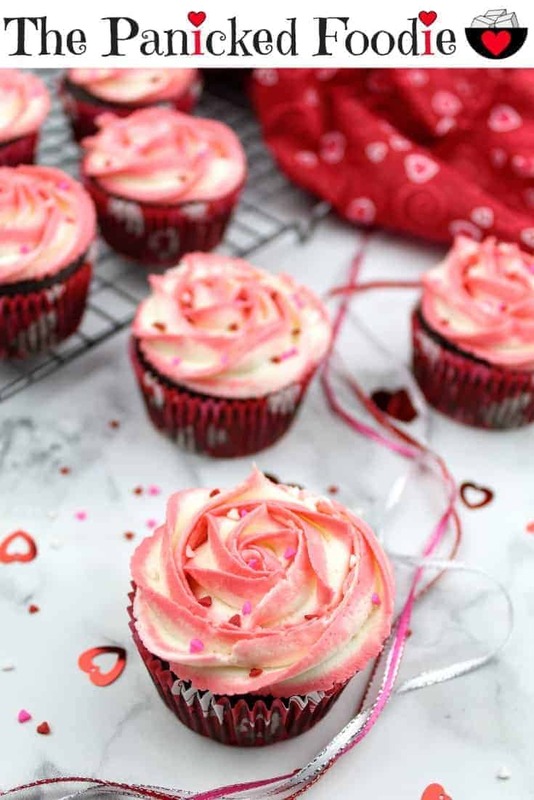 You guys…this is my very FIRST cupcake recipe on The Panicked Foodie! I remember baking cupcakes for the first time several years ago and it was a disaster. I filled the cupcake liners with too much batter, and the cupcakes went EVERYWHERE. I remember turning the oven light on, and watching them rise as they baked. When they first started to rise, they looked so beautiful! But then my face quickly turned to horror as they continued rising beyond the cupcake liner, then the confines of their holder in the muffin tin. I thought surely, they have to stop rising at some point! Nope. They kept on going. Finally, I had to terminate the baking session and remove them from the oven. Needless to say, I haven’t touched that end of the baking spectrum in a long time. 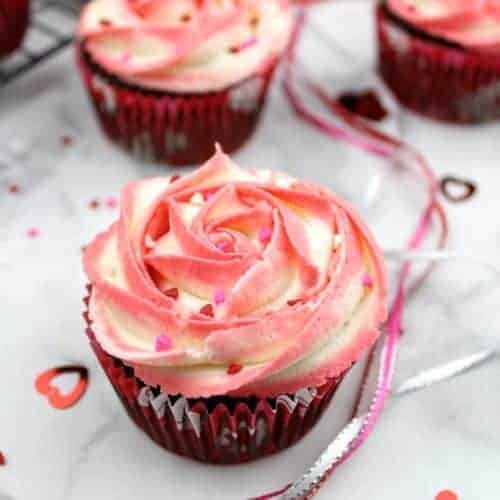 However, I have some cupcake ideas that I really want to try out. Obviously in order to do that, I will need to get over this incident. So, I wrote up a recipe for these cupcakes and decided to try it out the other day. I was very mindful of my filling, and thankfully there were no disasters! These vegan chocolate cupcakes are FANTASTIC! I’ve also made them gluten-free, as I’ve seen a lot of people looking for gluten-free chocolate cupcakes. I’ve had a lot of dry cupcakes in my lifetime, and these are far from it. They are very moist, and super fudgey. 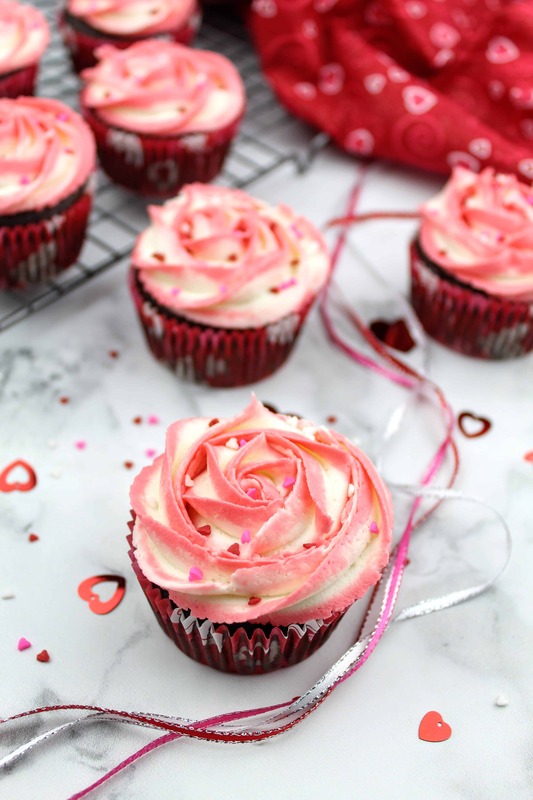 I topped them with a two-toned vegan vanilla frosting in celebration of the upcoming Valentine’s Day. These cupcakes are great for that special someone in your life…your spouse, significant other, friend, and yes, even yourself. 🙂 Let’s hear it for self-love and self-care in the form of delicious cupcakes! A muffin is generally thought to be on the healthier side of the spectrum when compared to a cupcake. A muffin you can order as part of a meal, such as for breakfast. They can be filled with fruit, and they can also be on the savory side. Cupcakes on the other hand, are thought of as a dessert item and they are always topped with frosting. Cupcakes are in essence a mini hunk of cake! How do you make the best cupcakes? There are many things you can do to ensure that your cupcakes are delicious. The first, which goes for any recipe, is to use the best ingredients available and that you can afford. 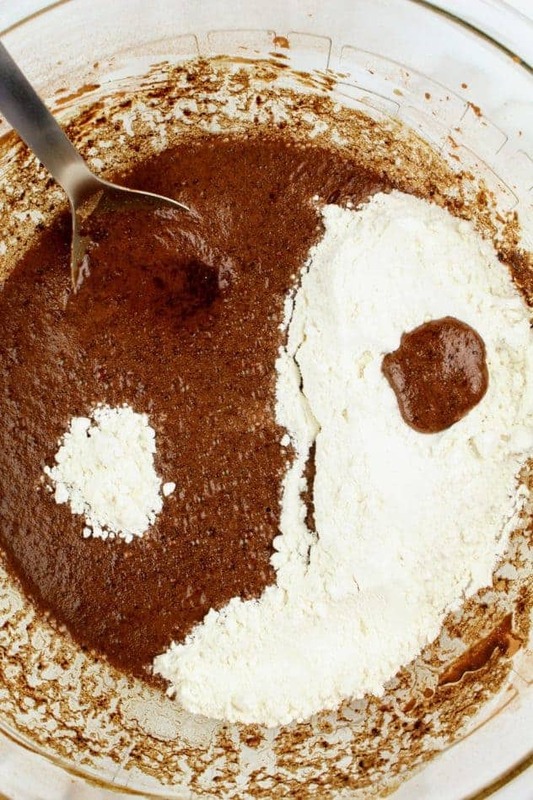 The second is to not over mix the batter. The third thing, which I think is the most important, is to not overfill your cupcake liners. I have had a few disasters in my past, and you really want to make sure you measure out the batter before filling. And probably the fourth thing, is to not over bake them. I’ve given a time range for baking, but I would take them out at the shortest time and test for doneness (see step 4 below on how to do this). Do frosted cupcakes need to be refrigerated? Cupcakes only need to be refrigerated if they have a filling or frosting containing dairy, eggs, or custard. For all others, it is safe to store at room temperature. However, I tend to store mine in the fridge in an airtight container. Yes! You can freeze them in both their frosted and unfrosted form. If you are looking to do this, check your freezer to make sure you have enough room. To freeze cupcakes whether frosted or unfrosted, arrange the cupcakes on a baking tray and place in the freezer. After a few hours, check to make sure they are completely frozen (including the frosting, if you frosted them). After they are completely frozen, remove the baking tray from the freezer and individually wrap each cupcake in plastic wrap. Label with the date and place back in the freezer. Store for up to a month or two. 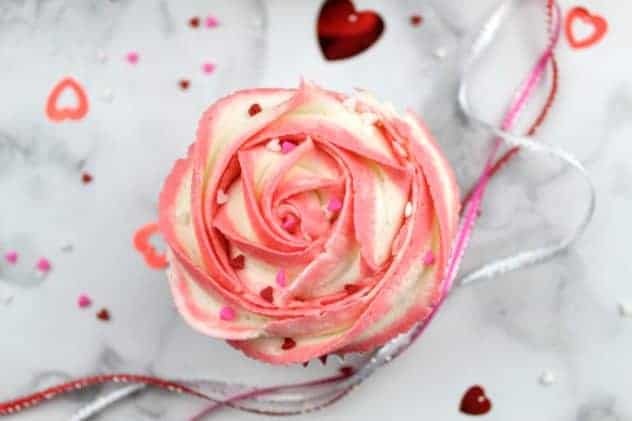 To thaw, remove a cupcake from the freezer the day before you intend to eat it and place in the refrigerator. It’s important to note that not all frostings will freeze well. The frostings that should freeze well are those high in fat (e.g., buttercream). Allow cupcakes to cool completely before frosting them. Otherwise, the frosting could melt and lose its shape. Batter after one cup of flour added. 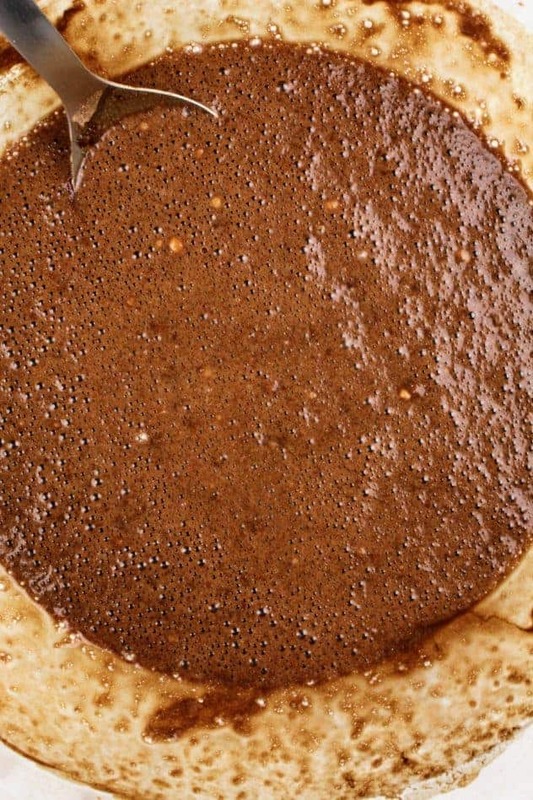 Batter after one-and-a-half cups of flour added. 3. 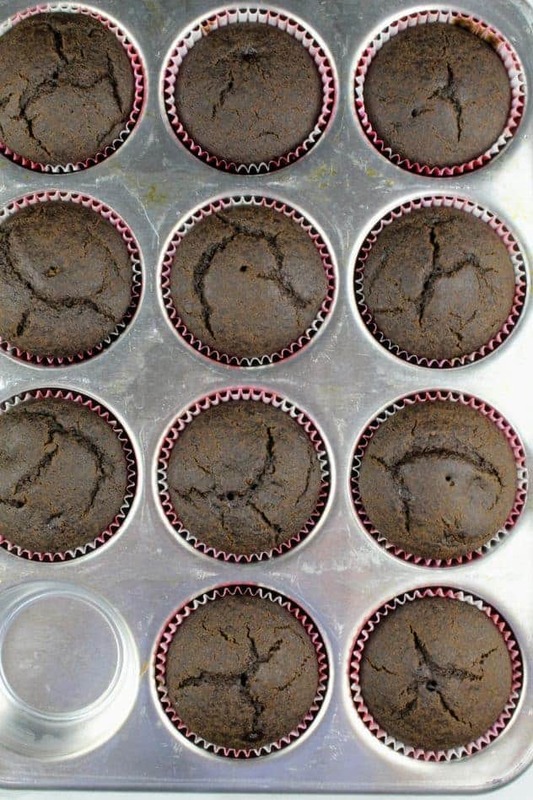 Prepare the muffin tin by placing a liner (or two!) into each spot. 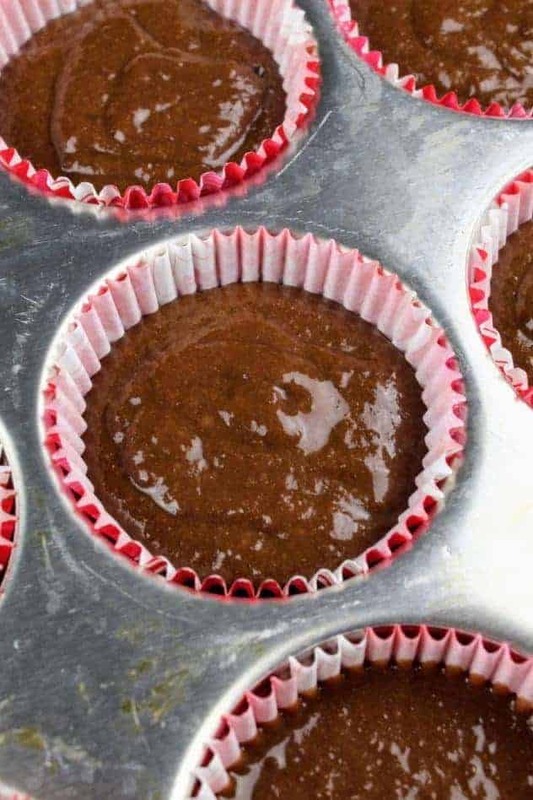 Fill each cupcake liner with about 3-4 tablespoons of batter. The cupcake liner should be 2/3-3/4 full. To do this, I used my glass Pyrex measuring cup. I filled up the cup to the 1 cup line, then I poured out <1/4 cup (4 tablespoons) of batter into each cupcake liner. 4. Bake at 350F for 20-30 minutes. To test if they’re done, insert a toothpick into the center of the cupcake. If it comes out clean, then the cupcake is done. The second test I like to perform, is to lightly press on the cupcake. If it springs back, then that is another indication that they are done baking. If you look close enough in the photos below, you can see the holes in the cupcakes where I tested them with a toothpick. 5. Feel free to decorate the cupcakes however you want! I used a two-toned vegan vanilla frosting and then topped with sprinkles. 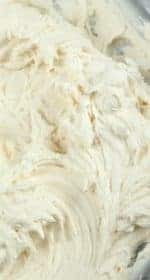 Head on over to my recipe for vegan vanilla frosting to find tips on how to make and pipe a two-toned buttercream frosting. 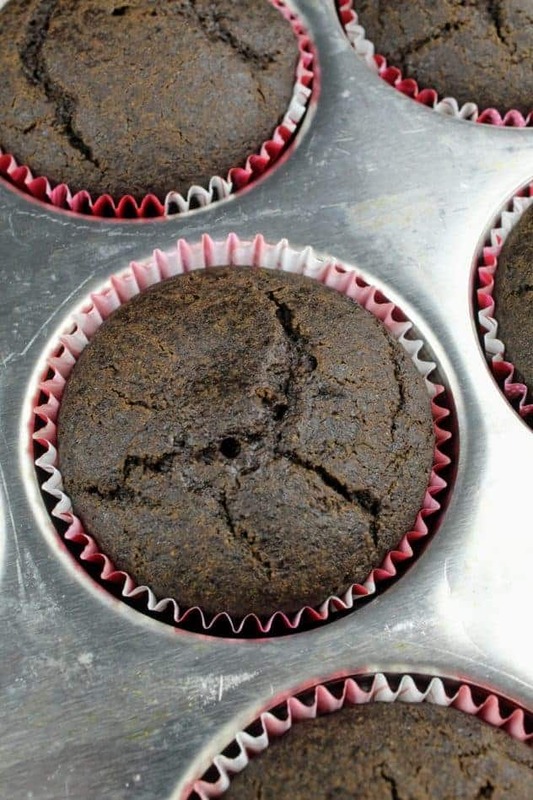 These gluten-free and vegan chocolate cupcakes are delicious and are made in only a single bowl! Decorate with frosting and sprinkles. 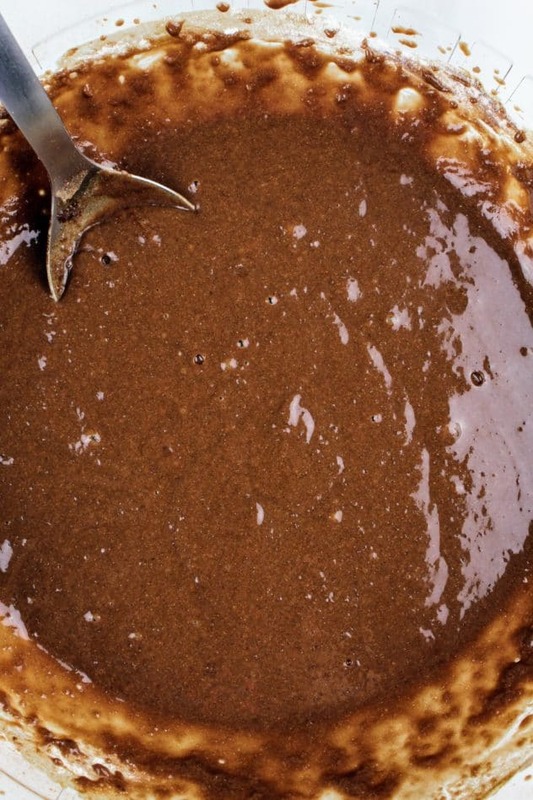 Add everything but the flour to a large mixing bowl. Use an electric mixer on a low setting to mix together. Add the flour in, in two increments (one cup first, then half of a cup). Stir with a mixing spoon just until combined after each addition. Prepare the muffin tin by placing a liner (or two!) into each spot. 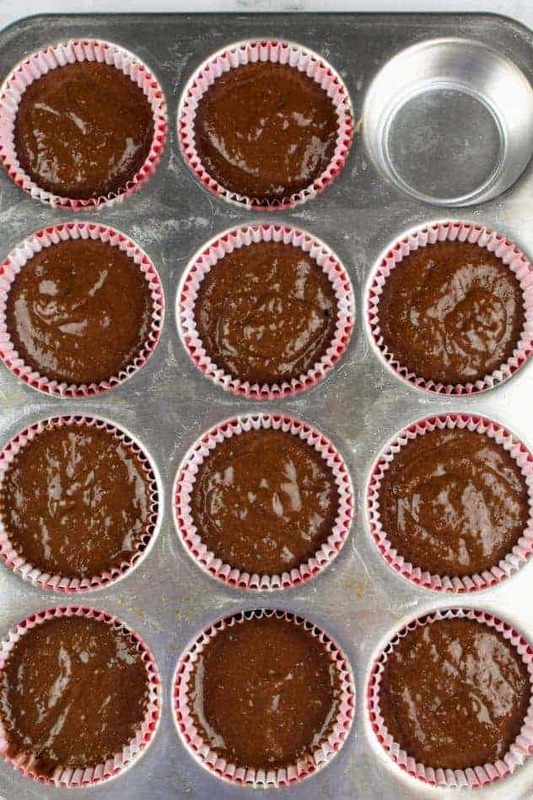 Fill each cupcake liner with about 3-4 tablespoons of batter. Cupcake liner should be 2/3-3/4 full. Do not overfill! Bake for 20-30 minutes, or until an inserted toothpick comes out clean and the cupcake bounces back after it's been lightly pressed. Let cupcakes cool completely before decorating with frosting, sprinkles, etc. Enjoy! I love a good chocolate cupcake. I mean who doesn’t! I can’t wait to try your vegan version. The balsamic vinegar has me so intrigued. These Cupcakes look so adorable and I love that they are vegan! Perfect for Valentine;’s Day! 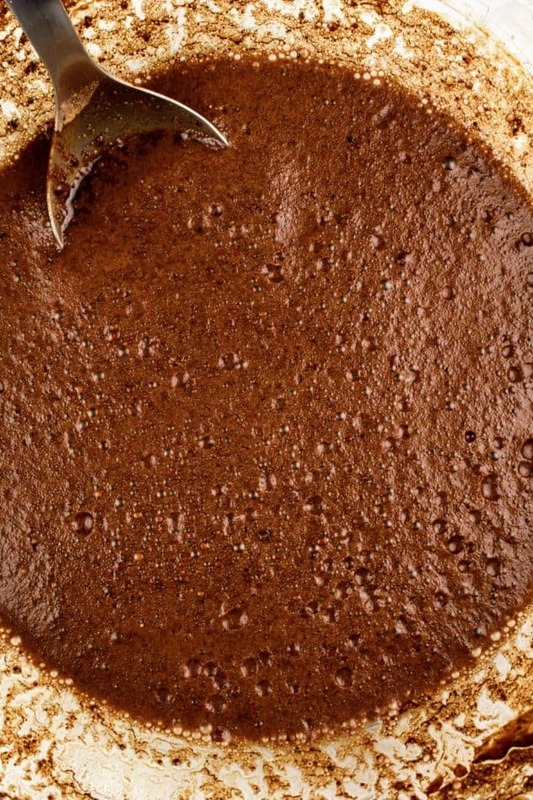 Balsamic vinegar is such a clever add! And perfect with chocolate. These chocolate cupcakes look so delicious and adorable! I can’t wait to try these out for the holiday. Oh my word, I need these cupcakes in my life! I’m the biggest chocoholic going so that sold me. And it’s great to know that they’re vegan too. Congratulations on your first cupcake recipe and I am thankful that you shared it. It looks really pretty and delicious. Can’t wait to try it this weekend since I’m planning to give the girls some baking lessons. Now you shared something of my interest. Thanks for sharing such recipes for the cup cakes. This looks fun to make. I like the frosting on the main photo. I can(t make cupcakes as my oven isn’t big enough to make them! I have a small oven. If I want to make cupcakes, I have to make them a community center, which I could someday.